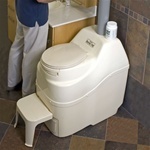 Self-contained compost toilets are easy to install and they use no water! The compost toilets you see here are electric units only, meaning they must be plugged into a 110V outlet, but we also offer compost toilets that are non-electric, as well. 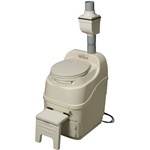 The electrical features of the compost toilets below include a thermostatically controlled heater to evaporate liquid and a fan assembly that maintains odorless operation. 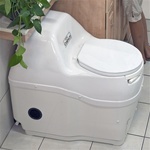 For units that feature a more traditional looking toilet in the bathroom, please visit our category of central system compost toilets. Do you have questions about any of the units you see here? Please visit our Frequently Asked Questions page! You'll find answers to the most commonly asked questions like, "Will it smell? ", "Is it difficult to install? ", and "How do I clean it?" If you still have questions after reading through the FAQ's, please feel free to contact us. We're available Monday through Friday from 7:00 am to 4:00 pm Central time, and we're always happy to assist you with placing an order, checking on your order status, or simply answering questions about our products. Not sure which of these units is right for you? We know that product selection can get a little confusing. After all, we offer over 20 different models with a variety of options and choices. If you haven't visited our Product Selection Guide yet, now is the time! There you'll find a chart listing every model we sell, along with the most important specifications about each unit. 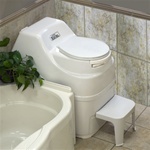 Browse by capacity rating, electric vs. non-electric, water flush vs. waterless, etc. The Product Selection Guide will help you narrow down your list of options very quickly. Once you have narrowed down the range of choices to one or two models that you think might be right, the next step is to download the Product Instruction Manual. This comprehensive document is available in PDF format for every system and unit we sell, and you'll find a link to it from the Product Detail Page for the specific item you're interested in. We always encourage our customers to allow plenty of time to read and thoroughly understand all the product information before they get ready to make a purchase. These are complex and expensive systems, so it's important to educate yourself before making the investment. If you have any questions or you're confused by something you've read in one of the Product Instruction Manuals, please don't hesitate to contact us. We are always happy to help, and if we don't know the answer to your question right away, we will research it, find the answer, and get back to you as quickly as possible. Did you know that our sister store, Home Products 'N' More also sells a variety of unique and hard to find eco-friendly products? Home Products 'N' More is a great website to visit if you're looking for quality items for your home, garden, or auto, and it's also the perfect place to find unique and unusual gift ideas for friends and family. And best of all, we offer free shipping and handling on every product at Home Products 'N' More, which makes shopping and sticking to your budget that much easier.